Heat oil in a pan. put squid and shrimp stir 30 sec and then put egg stir around 10 sec. Put noodle, oyster sauce, fish sauce, sugar, tofu, and water 2 tablespoon. Stir it until noodle soft. Put bean sprouts, preserved turnip, green onion and then cook it to combine. 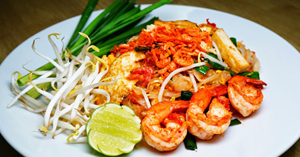 Serve to a dish and then put red chilli, crushed peanut and lemon juice in a Pad Thai. Soak the noodles about 30 minutes in room temperature water.